One of the difficulties in doing molecular research on the kidney is the diversity highly specialized cells that exist in the glomerulus. As a result, it is important to be able to isolate glomerular tissue from the surrounding kidney. A recent paper in KI detailing a method for isolated podocytes reminded me of a relatively simple technique that I was taught a few years ago for glomerular isolation in mice. The technique was first described in this paper from 2002 but in brief, it involves injecting the mouse heart with deactivated magnetic beads (after euthanizing them of course). 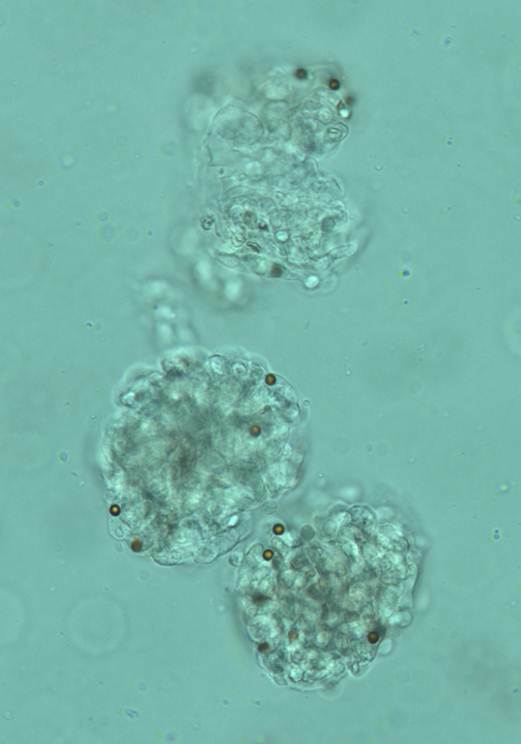 Some of these beads (which are just 5µm in diameter) get trapped in the glomerular capillaries. The kidneys are then removed, minced, digested and passed through a 100µm strainer to remove any larger particulate matter. Finally, the remaining tissue is suspended and exposed to a magnet to pull the glomeruli (with the beads inside) out of the mixture. The glomeruli are then left stuck to the wall of the tube next to the magnet and they can be easily removed. 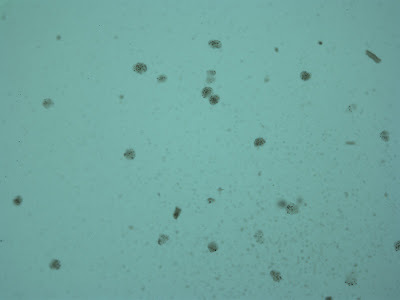 The picture below is a low-power view of the glomeruli following isolation. 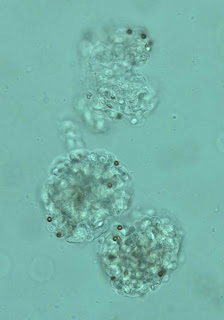 You can see that there is very little non-glomerular tissue present, which is remarkable given that the glomeruli make up such a small proportion of renal tissue. Over the past few years, it has become apparent that hyperaldosteronism is far commoner than was once suspected and screening of unselected patients with hypertension reveals that about 5-10% of patients have primary hyperaldosteronism. In patients with resistant hypertension, that percentage increases to 15-20%. About 30% of hyperaldosteronism is caused by aldosterone producing adrenal adenomas (APA). Most of the rest is related to bilateral adrenal hyperplasia with less than 5% of cases being familial. The secretion of aldosterone in adrenal cells is dependent on the intracellular calcium concentration and increases in response to higher plasma calcium. Entry of calcium into the cells is in turn dependent on voltage-gated membrane calcium channels (which allow calcium influx when the cells are depolarized) and a calcium ATPase which removes calcium from the cells. Under normal circumstances, adrenal cells are hyperpolarized thus keeping these calcium channels closed. Cell polarization is maintained by a combination of the action of the Na-K-ATPase (which exchanges 3 intracellular Na for 2 extracellular K) and membrane K channels lead to K loss from the cells. 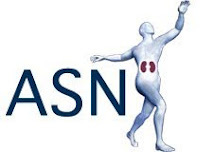 Angiotensin II inhibits the Na-K-ATPase leading to cell depolarization, calcium influx into cells and aldosterone secretion. Similar effects are seen when cells are treated with oubain, a specific Na-K-ATPase inhibitor that also leads to hyperaldosteronism. In 2011 in a seminal paper in Science, Choi et al reported finding somatic mutations in KCNJ5, a membrane potassium channel in patients with APA. These were identified by sequencing tissue from the tumors and comparing with the surrounding tissue. Subsequently, it has been found that about 30-40% of patients with APA have somatic mutations in KCNJ5. These mutations are believed to reduce the ion selectivity of the channels, allowing Na to move into the cell and reduce the resting membrane potential. A number of families have been identified with KCNJ5 mutations resulting in bilateral hyperplasia - now called Familial Hyperaldosteronism type III. Recently, a paper was published in Nature Genetics which attempted to determine if there were other somatic mutations in patients with APA. In this study, they took KCNJ5-normal patients and sequenced the exons of the tumors and the surrounding tissue. There were very few mutations identified but 5/9 patients had mutations in ATP1A1, a component of the Na-K-ATPase or ATP2B3, a component of the calcium ATPase that removes calcium from adrenal cells. Follow-up targeted sequencing of 300 patients with APA revealed that about 7% had mutations in one of these two genes. Patients with these mutations had higher aldosterone levels, lower minimum potassium levels and higher systolic BP, all indicators of more severe disease. Notably, no families have been identified with these mutations. In vitro studies revealed that cells with these mutations have very low membrane potentials and it is speculated that if this was a germline mutation, it would likely not be compatible with life. This is a fascinating insight into how very small changes in electrolyte channels can have far-reaching consequences and shows a great progression from exome sequencing to the bench and to clinical investigation. The images in this post are taken from the recent paper in Nature Genetics. One would wonder if somatic mutations explain some of the missing heritability that were are seeing in genetic studies of common diseases. See this previous post by Lisa on the genetic causes of hypertension. It seems incredible now that it was only in 1998 that it was conclusively proven that the podocyte plays a vital role in the prevention of albuminuria. At that time mutations in NPHS1, encoding nephrin, were found in 49 patients from Finland with congenital nephrotic syndrome. Up to that point, the podocyte was thought to play a secondary role in the glomerular filtration barrier. 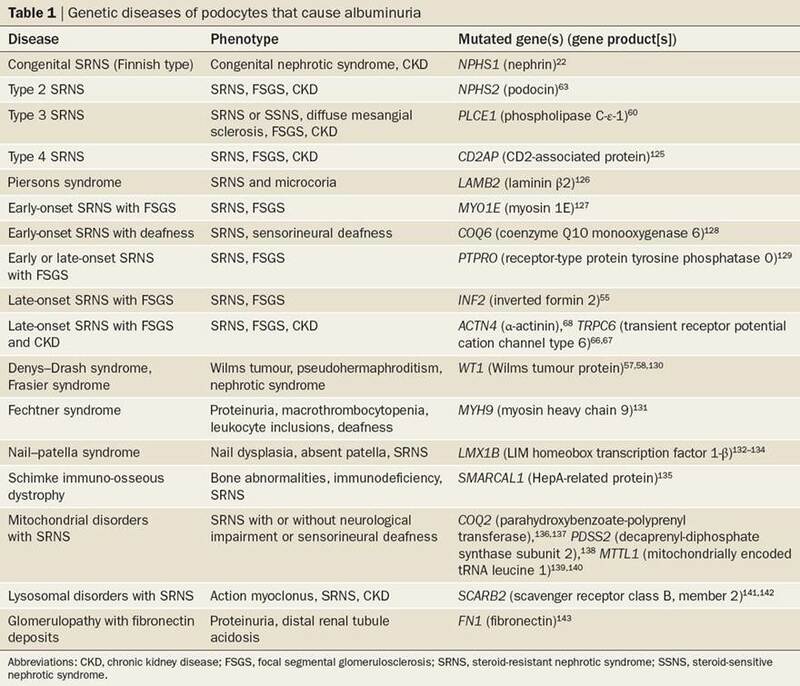 Since then, multiple mutations in different podocyte proteins have been identified in association with proteinuria. 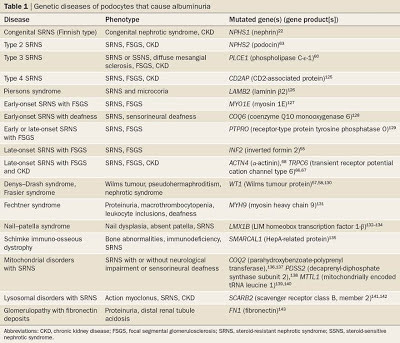 The table below (taken from a recent Nature Reviews Nephrology article) summarizes the podocyte-related genes that have been associated with albuminuria (click to enlarge). Orthodoxies continue to be challenged - the old model of podocytes that are fixed in place is being replaced by one where podocytes are constantly moving, being shed and replaced. 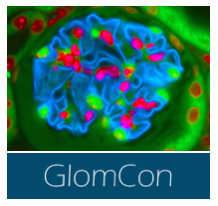 The video below is from a remarkable paper where the authors have used GFP to visualize podocytes in mouse glomeruli. The pulsatile nature of glomerular contractions is notable and fascinating. My attention was caught by the recent article in CJASN which compared the mortality of peritoneal dialysis (PD) and hemodialysis (HD) patients in the first 2 years of dialysis therapy. When comparing survival outcomes of PD and HD patients, the data we have so far is based on observational studies. A randomized controlled study has never been successfully completed because of difficulties in randomization. The only randomized study so far - the NECOSAD study (Netherlands) managed to randomize only 5% of the eligible subjects3. The study used information from two large databases viz. USRDS and Da Vita, providing a large cohort of almost 24000 incident dialysis patients. Separate analysis was conducted using a Kaplan–Meier survival curve, cox proportional hazards and the MSM model. A 48% greater survival for incident PD patients at 2 years was found using the MSM model. These findings were in contrast to findings in other studies in the past which showed either no difference in survival or marginal survival advantage especially in the first year for PD compared to HD5. Additionally, a comparison between the cox model and the MSM demonstrated that the time-dependent confounders determined the difference in survival. Changes in modality during the ﬁrst 2 years of dialysis affected the survival patterns over time and the reason for this trend is not completely understood at this point. This study supports greater use of PD in the treatment of ESRD patients especially in US where less than 8% of prevalent patients with ESRD are on PD.A comprehensive dialysis modality education program should be encouraged to expand the practice of PD. See these two previous posts on the debate between PD and HD. Na 170 mmol/L, K 3.2 mmol/L, low-normal urea and creatinine. Her other labs were normal. She denied any thirst and did not look volume depleted. Because of the doubt about the accuracy of the sample, it was repeated. Her repeat sodium was 139mmol/L. After questioning the intern that took the labs, it became apparent that multiple attempts had been made to take blood. The intern had managed to take a coagulation sample but had failed to get a sample for electrolytes. As a result, she transferred some of the blood from the coag bottle to the lithium heparin bottle. The coag bottle contained trisodium citrate and this had contaminated the serum sample resulting in a spuriously high sodium concentration. This was confirmed by testing the original and repeat sample for calcium. In the original sample it was 1.88 mmol/L and in the repeat it was 2.34 mmol/L. This was due to the chelation of calcium by citrate. Classically, spurious hyperkalemia and hypocalcemia occur in the setting of contamination by EDTA. Pseudohypernatremia is less common but should be considered first in cases of severe asymptomatic hypernatremia. Not really a nephrology post but in view of all that happened at the time of the Marathon bombing, I felt that I should highlight an article posted in JAMA this week. 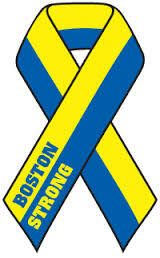 Although 3 people unfortunately died as a result of the bombing, the fact that every patient who made it to a hospital survived is a testament to the skill and preparedness of the emergency response system in Boston. As the article points out, this was not an accident but was the result of years of refining protocols and performing regular drills to prepare for such an incident. The article focuses mostly on the response at my institution - the Brigham and Women's Hospital - largely because the author works there, but the fine work that was done in the Brigham that day was repeated in all of the other centers where the victims presented. Here is a personal account from the finish line from the NEJM. Here are 3 more accounts from the NEJM detailing the response and the happenings of the day. This month's issue of NDT has an interesting debate concerning whether or not clinical laboratories should start reporting CKD-EPI GFR instead of MDRD. The pro side is here while the con side is here. Basically, the argument for changing is that there is less bias in the CKD-EPI equation, it is more accurate at higher GFRs and more accurately classifies patients as stage 3 as opposed to stage 2 (in terms of overall prognosis). The counter-argument is that, although there is a slight decrease in bias associated with the use of CKD-EPI, it is not any more precise than MDRD - this is more a fault of creatinine as a test of renal function rather than a specific problem with the equations. It should also be mentioned that the CKD-EPI equation is not necessarily better in all circumstances - as documented by Leo in this post about renal transplant recipients. To (perhaps) settle the argument on one side, the moderator of the debate wrote a commentary and came down on the side of changing to the CKD-EPI equation. The argument is that, even if the improvement is slight, we, as a nephrology community, should not settle for something that is clearly inferior in most circumstances. MDRD was developed in a population of patients with CKD and therefore does not accurately reflect GFR in healthy populations. For this reason, in the research community, there has been a move towards more use of CKD-EPI in the recent past as it is more appropriate for epidemiologic research. The switch to CKD-EPI would not require the use of any new analytes - a simple change in coding in the computers reporting results. In fact, a number of organizations have already switched. Two other things to mention. Neither equation has been properly validated in Asian populations and this needs to be remedied. Secondly, the role for cystatin C-based or combination equations is still uncertain. Cystatin C is a better predictor of outcomes than creatinine but there are many non-GFR determinants of cystatin C that are likely biasing this and are not related to renal function. Also, the cystatin C test is expensive and has not been fully standardized. There may be a place for the combination equation in patients with borderline GFRs (45-60) in whom the diagnosis of CKD is uncertain. For the final part of the series on Vitamin D and cardiovascular disease, we'll focus on the relevant clinical trials. Again, for full attribution, the primary source for this is the excellent review at Nature Reviews Nephrology. Parts 1 and 2 of this series can be found by clicking here and here. 1. Inflammation: As mentioned before, vitamin D has been shown to have anti-inflammatory effects in animal studies. A number of studies have examined the effect of vitamin D supplementation on inflammatory mediators. One study took ~120 patients with CHF and treated them with cholecalciferol or placebo for 9 months. Levels of anti-inflammatory IL-10 were higher and TNF was lower in treated patients. However, there was no difference in LVEF or mortality between the two groups and about 20% of patients did not complete even 9 months with more dropouts occurring in the vitamin D group. Similar reductions in pro-inflammatory cytokines have been noted in HD patients and patients with diabetes although these studies were too small and short-term to show any clinical effects. 2. Hypertension: Results from meta-analyses have been inconsistent with one study showing a non-significant decrease in BP with vitamin D therapy and another showing a reduction in systolic BP only. Currently, there is insufficient evidence to suggest that vitamin D is effective to treat hypertension. 3. Chronic Kidney Disease: Given the well-described relationship between vitamin D and the kidney, it is unsurprising that there has been a focus on CVD prevention in patients with CKD. Again, the results are inconsistent with some studies showing a benefit in terms of CV risk and others being negative. The PRIMO study examined LV mass index in patients with CKD and looked at the effect of 48 weeks treatment with activated vitamin D. There was no difference in the primary outcome among the two groups. One important point is that, in the past, there was no focus on 25OH vitamin D in patients with CKD due to the perception that it is biologically inactive. This perception is changing and there may be a role for increased 25OH vitamin D supplementation in CKD patients although this role has not yet been fully defined. 4. Cardiovascular Death and stroke: Large meta-analyses have suggested a benefit of vitamin D therapy on all-cause mortality. The results for CV mortality and morbidity are less consistent although a benefit has been shown in some trials. One issue is that most studies do not limit treatment to patients with vitamin D deficiency while subgroup analysis of some trials shows that there is more benefit of therapy in these patients. There are a number of large trials of vitamin D currently ongoing (see table below from this recent review). Hopefully we will be able to get a clearer picture of the benefits of vitamin D therapy in the near future. Overall, the results of the intervention trials have been disappointing and inconsistent - particularly given the strength of the observational and experimental data. At this point, we still don't know the exact role for vitamin D in the prevention and management of CV disease. There is always the suspicion that unmeasured confounders have an important part to play. The best way to get an answer is by doing well-designed RCTs and perhaps when these ongoing trials are complete, we will have a fuller idea of this role. In the second post on vitamin D and CV disease (again largely summarizing this excellent review in Nature Reviews Nephrology), we look at the epidemiological evidence for the association of low vitamin D levels and CVD. 1. Hypertension: Data from NHANES showed that there is an inverse relationship between vitamin D levels and hypertension after full covariate adjustment. Subsequently, data from the Nurses Health Study revealed that low baseline vitamin D levels were associated with an increased risk of incident hypertension. In patients with established hypertension, low levels of vitamin D were associated with an increased risk of CV and all-cause mortality. 2. CV Morbidity and Mortality: Multiple large cohort studies have demonstrated a relationship between low vitamin D levels and CV mortality after controlling for traditional risk factors in a wide variety of populations including Europeans and African-Americans. Data from the Framingham Heart Study suggest that a low level of vitamin D was associated with a HR of 1.62 for incident cardiovascular events after about 6 years follow-up. 3. Chronic Kidney Disease: In patients with chronic kidney disease, there is a U-shaped association between vitamin D levels and CV events. However, this relationship is attenuated after adjustment for baseline GFR suggesting that the primary portion of this risk is related to the severity of renal disease (which may be the cause of the vitamin D deficiency). Low levels of vitamin D have been associated with an increased risk of mortality in dialysis patients while also being a predictor of progression to ESRD. 3. Stroke: Low levels of vitamin D have been associated with an increased risk of ischemic stroke in participants from the Nurses Health Study. Again, it is important to point out that all of these associations do not prove causality and that there is likely a strong lifestyle or other biologic component in these associations that is not being accounted for. Next we'll look at the clinical trials of vitamin D and CVD prevention. 1. RAAS system: As mentioned in a previous post, vitamin D is a negative regulator of RAAS. Renin and angiotensin II levels are elevated in mice lacking the vitamin D receptor (VDR). In humans with low vitamin D levels, increased angiotensin II has been noted although it should be pointed out that patients with hereditary vitamin D resistant rickets (due to a lack of the VDR) do not have elevations in RAAS hormones. 2. Inflammation: Vitamin D has anti-inflammatory effects mediated via the downregulation of IL-6 and TNF expression. Cardiac endothelial cells contain VDRs and vitamin D treatment inhibits TNF activation in these cells. Given the association between inflammation and atherosclerosis, this is a potential mechanism for the putative link between vitamin D deficiency and atherosclerotic disease. 3. Endothelial Function: In vitro treatment with vitamin D downregulates the production of pro-thrombotic proteins in endothelial cells. Vitamin D deficiency has been associated with endothelial dysfunction in human studies but again, the contribution of residual confounding in these observational studies is uncertain and may be substantial. 4. Cardiac Remodeling: Studies in rodents have suggested a role for vitamin D in the prevention of LVH and adverse cardiac remodeling in models of hypertension and cardiovascular disease. There is growing interest in the association between FGF-23 and CV disease. Treatment with vitamin D stimulates the release of FGF-23 and may be an adverse consequence of the use of supplements in patients with advanced CKD. Given the amount of vitamin D prescribed in the dialysis world, it is important that we understand the potential consequences and mechanisms of the risks and benefits of this treatment. For appropriate references please see the NRN review. 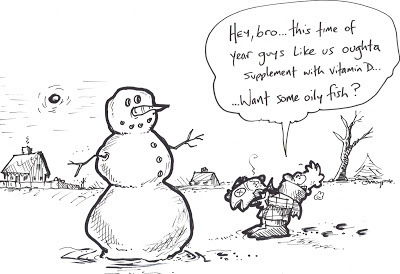 A previous summary of the use of vitamin D in CKD can be found here. Bill Peckham, the author of the excellent patient advocacy and home dialysis blog: dialysis from the sharp end of the needle has been on dialysis since 1990 and home dialysis since 2001 where self-cannulates using the buttonhole method. Last year he posted a video on Youtube that I only came across today. It shows his technique of needle insertion. I have often wondered how patients manage to cannulate themselves at home and this demonstrates it very nicely. I am full of admiration for my patients. Following on from yesterday's update on membranous nephropathy, I thought that this would be a good time to give an update on the treatment of another, very common glomerular disease: IgA nephropathy. IgA has been covered extensively on the RFN before including the history, pathogenesis, diagnosis, features and treatment: collected in this group of posts. 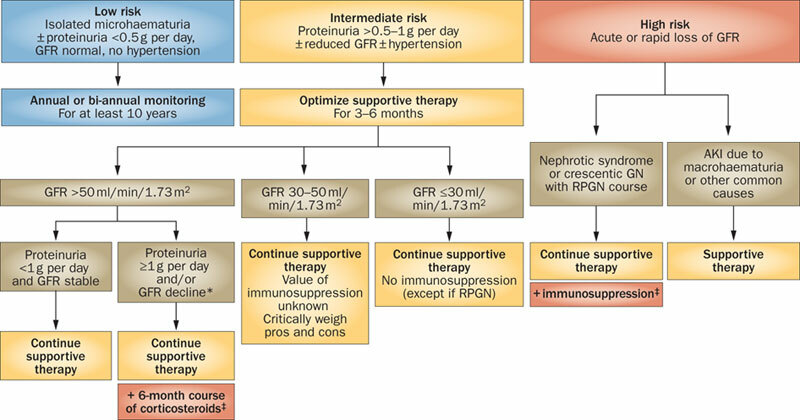 This month an excellent review of the treatment of IgA nephropathy was published in Nature Reviews Nephrology which highlights some of the difficulty and controversies in the treatment of IgA. As the authors point out, one of the major difficulties in determining the best treatment (and assessing the comparative effectiveness of therapies) is the heterogeneity in the presentation and prognosis of patients with IgA. It is extremely common, with up to 1.6% of zero-hour allograft biopsies having evidence of asymptomatic IgA. As a result, many patients are diagnosed incidentally and never have any clinically significant disease. One important issue relates to determining who is going to progress. The recently introduced MEST classification came about in an effort to define histological markers in IgA that predict progression. However, follow-up studies have indicated that the only consistent marker of progression was the degree of interstitial fibrosis and atrophy. It should be noted that this classification does not include crescents which are associated with a poor prognosis. Traditional clinical markers of progression include hypertension, increased BMI, smoking and, most importantly, persistent proteinuria of >1g/24 hours. The treatment of IgA depends on the clinical presentation. 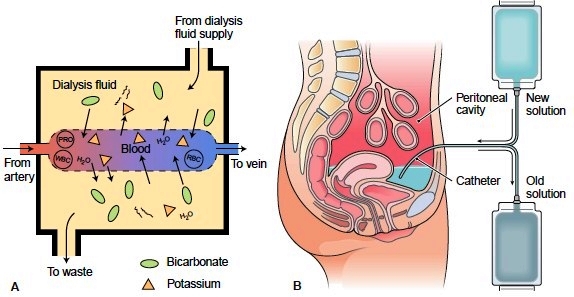 Patients with normal blood pressure, normal renal function and no proteinuria can generally be watched in the clinic with no specific treatment and, in fact, it is debatable if these patients should be biopsied in the first place. The figure below (originally from JASN and reproduced in NRN) provides a suggested algorithm for the management of patients with IgA depending on the stage at presentation. 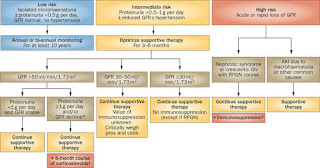 It is important to state that the only treatment that has been consistently been shown to be beneficial in patients with IgA is RAAS blockade.The role of corticosteroids is controversial and the current KDIGO guidelines suggest the use of steroids only in patients who have been on optimal therapy for 3-6 months, have persistent proteinuria >1g and have an eGFR of >50 ml/min/1.73m2. Low dose steroids are of no benefit and the use of higher dose steroid regimens is associated with significant morbidity so this recommendation comes with significant caveats. Other immunosuppressants including cyclophosphamide, MMF and azathioprine have been trialed in IgA and despite some encouraging results in open-label and retrospective studies, prospective studies have failed to show a consistent benefit. However, there are ongoing RCTs that will be reported in the next 12-24 months that may finally give us the definitive answer with regard to these agents. Tonsillectomy, more commonly performed in Japan, is not recommended, either by these authors or in the KDIGO guidelines. Fish Oil may be of benefit in patients with persistent proteinuria >1g but is probably of limited use in other groups. One of the limitations of the studies of fish oil in IgA is that they were generally performed prior to the widespread use of ACEi and it is uncertain if they add any additional benefit to these agents. Again, the dose needs to be sufficient (supranormal doses). Finally, crescentic IgA is a different entity that generally is associated with rapid progression. It is only diagnosed when more than 50% of glomeruli have crescents; the presence of a single crescent in one glomerulus should not prompt the institution of aggressive immunosuppressive therapy. Again, there are no RCTs that demonstrate a benefit of cyclophosphamide but there are some retrospective studies that have shown some effectiveness. That said, in the presence of rapidly progressive disease and active glomerular inflammation, the recommendation is that a combination of steroids and cyclophosphamide should be used. U Penn established an annual one-day seminar in nephrology symposium. 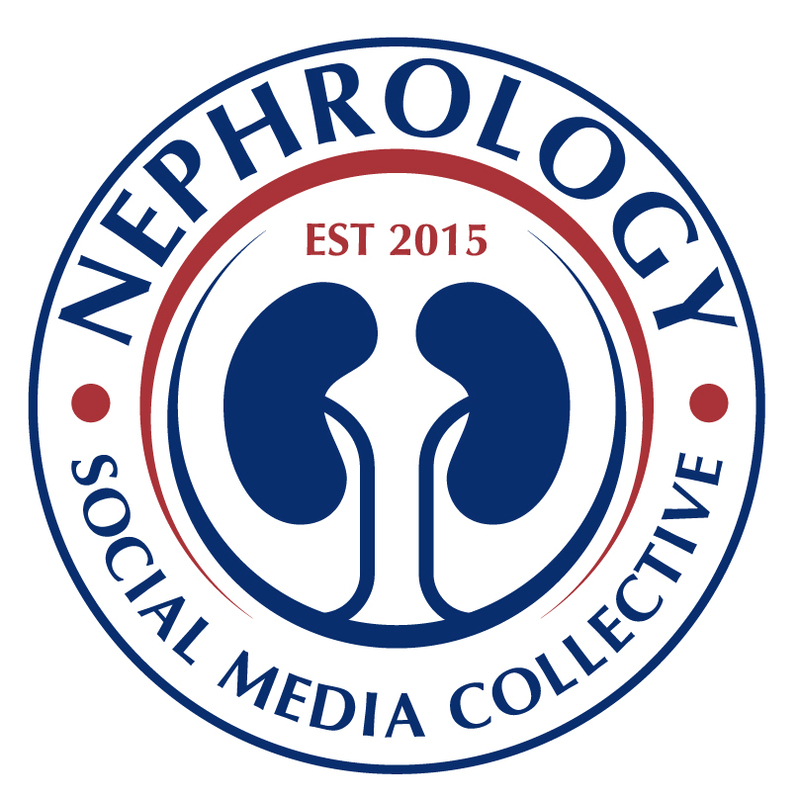 This year was titled “New Horizons in Nephrology: Updates in Glomerular Disease”. 75% of MN is considered primary (idiopathic). IgG4 subclass is predominant in idiopathic MN. Co-localization of PLA2R and IgG4 within immune deposits on biopsy. The majority of patients with primary MN have circulating autoantibodies against PLA2R. There is a clear association of anti-PLA2R with disease activity. - Positive in nephrotic state. - Declines prior to the decrease in proteinuria. - Returns with (or prior to) relapse. - ELISA : Will likely be the test of choice. Available in Europe, not yet in the US. - Do NOT use corticosteroid monotherapy or MMF monotherapy for initial therapy of MN. - No single definitive immunosuppression could be easily identified. Ponticelli regimen: methylprednisolone 1g/d iv x 3 doses followed by oral prednisone 0.5mg/kg/d in months 1,3,5; oral cyclophosphamide (2mg/kg/d) in months 2,4,6. Alternative initial therapy for those who refuse or have contraindications to cyclophosphamide is Calcineurin inhibitor (CNI) for at least 6 months. Stop if no remission in 6 months.